Definition of the WRVS = “all the women in one room who you would pay money not to meet”. This wasn’t my definition – it was taken from a line in Housewife 49, a televised play by Victoria Wood, about a wartime “diary keeper” called Nella Last, which I am taking the opportunity to watch again this morning. Not that I haven’t got anything else I ought to be doing !!! So why did I start my post with that quotation? because it occurs to me that I and many others spend a lot of their time and energy dealing with people who set themselves up as the font of all knowledge and superior to others. When in reality it is all stuffing and postering and they have serious flaws in their personality which we should not try to emulate under any circumstances !!! I am sort of thinking politicians here – and I am sure you can fill up the sentence quite well with other offerings….. I then find myself just trying to fit in, and end up following their instructions – wrongly or rightly – not because I don’t know any different, but because it is easier to play their game not challenge the rules by making your own. But the heartening thing about this tale is Nella finds “her” place in society, when all about her are being challenged about theirs and at the end of the tale those very high and mighty persons have been the ones needing to remake their rules to conform to the new society and expectations. One of the other things I love is the scene where the Navy socknitters are told to move away from the bandages… but it is OK if they are knitting in white. Some lovely boot socks are then waved around. I also found that there are difficult bits which you don’t want to do on the move, and then I sort of lost momentum. I have found by having a couple of pairs on the go at one time, I always have some “thoughtless” pairs to get on with. 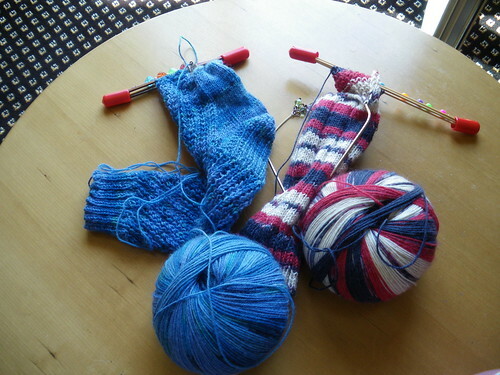 These are the Jubilee Socks on the right and the Hollykins on the left (Holly being my eldest son’s partner). I have also cast a pair on for Josh last night – so the race is on. Carrying on from yesterday and naming some blogs I read – I thought I would recommend some of my friends today – these are people I know in real life and are people I would pay money to be in the same room as rather than avoid….